The zombie apocalypse has been pretty fully explored in two-hour chunks. But no one had really tackled the genre in episodic television until recently. First, Dead Set debuted on IFC on Oct. 25. The survivors are sequestered on the set of a Big Brother house and initially think the whole thing’s a hoax. The five-part series is campy gore, an extension of the many silly and fun zombie b-movies available on Netflix. The Walking Dead , on the other hand, was done with all the cinematic care director Frank Darabont put into The Shawshank Redemption and The Green Mile and AMC put into Mad Men and Breaking Bad. With hours at his disposal to develop characters and plot, Darabont spends most of the hour-and-a-half pilot dipping us gently into the scene. The camera stays with the crumpling bedside flowers, the carcass of a woman in the flickering fluorescent light and the fingers poking through the cafeteria door before we see our first zombie since the gut-punch open. 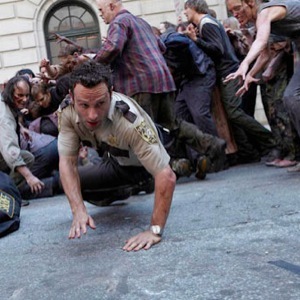 As coma-woken police officer Rick Grimes (Andrew Lincoln) stumbles past rows of dead bodies outside the hospital, we expect them to waken. We keep seeing bodies, and we’re kept guessing whether they’re live, dead or undead. The first survivors he meets are a father and son, Morgan (Lennie James) and Duane (Adrian Kali Turner) tormented by Morgan’s wife walking the streets outside the suburban home where they’re squatting. Unable to put her out of her misery or move on without her, they’re frozen in place, tormented by loss that hasn’t really gone away. It’s the most nightmarish of scenarios—hunted by the shell of a loved one—the zombies aren’t generic; this one is personal. Few living souls and little action for a zombie show also leads to good character development. Grimes is shell-shocked by the world he wakes up to and Morgan serves as his shepherd into reality. There are more survivors, and they’ve somehow got to work together and fight the fantastical, but they won’t always work together. It’s the horror version of Lost with fewer smoke monsters and more crawling torsos. The teaser for the remainder of the series is also reminiscent of Stephen King’s mini-series The Stand. The show’s glacial pace matches the walking dead themselves. There are no threatening zombie chases until the epic final scene. Slow as sleestaks, single zombies aren’t hard to put down. But en masse, they’re terrifying. And there’s a whole city full of them in Atlanta. It’s strange to see my city after the apocalypse. The downtown connector is a wasteland, abandoned cars packing the south-bound lanes, emptiness heading into the city. Grimes comes in on horse, straight past Marietta Street and Georgia State University and MARTA buses and buildings I drive past often. The tension as he wakes the dead builds until he runs into an undead crowd. Darabont let the tension build slowly all episode long, and any hope for salvation at the CDC comes crashing down as he realizes he’s trapped in a zombie city. As a voice crackles over the radio, he realizes he’s not alone. And I realize I’m definitely along for this ride. • The road-kill shots during the police chase really set the tone, but in Georgia that really should have been a possum. • Kudos to the zombie Toyota Corolla commercial. • It’s funny to talk about believability in a zombie show, but the fact that it was his wife’s camp who heard him on the CB radio seemed way too tidy. • Grimes needs to learn how to siphon gasoline. Read the review of The Walking Dead, episode 2.